The cold weather in the Bay Area has prompted a school in East Palo Alto to close for the rest of the week. School district officials said it was too cold for students, teachers and staff to be on campus after the heating system at Costano Elementary went out earlier this month. "People are freezing in classrooms and they can't do their work," student Isiah Robinson said. "I mean, if you want kids to actually be warm and comfortable in class, we have to fix this problem." Crews are still working to fix the heating system, which had to be shut down due to a gas leak. Officials said the school is safe, but crews need the next few weeks to fix it. 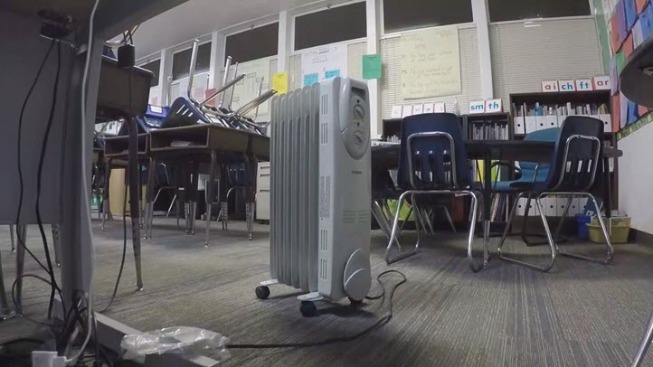 The school has been using space heaters to keep students warm. "It worked out perfectly fine last week. We were warm and cozy, but with inclement weather outside we just weren't able to get the temperatures up to make the classrooms conducive for learning," Costano School Principal Gina Sudaria said. The space heaters on Wednesday were overwhelming the school's aging electrical system, prompting the district to cancel classes at Costano and the 49ers Academy middle school on campus for the rest of the week. "I'm happy, winter break is early now," Robinson said. The school also had a winter performance scheduled for Friday, but due to the heating problems the event has been pushed back until next month. Sudaria said the decision to close the campus for the rest of the week "is kind of like our snow day of California." Some parents are now forced to find childcare alternatives. "Thankfully my older son just has finals and so he'll be around to help out," parent Stephanie Robinson said. The heat will return when the students do in January. But the district said this is the tip of the iceberg when it comes to repairing its schools: A bond will be proposed next year. "We hope we'll be able to get that support from the community to help us with bonds that we need to improve our facilities," Sudaria said.